Tattoos and piercings. This is phenomenal topic and will create many opinions, opinions pro and contra on this subject. I beg a sorry on that and please understand that I don’t even have any intention to judge any body. Please understand that I just want to share about my opinion at the moment. It’s true, only my opinion. I don’t have any power to judge a people or to declare one thing is right or wrong. I love tattoos art as much as I like art. I knew step by step of the work until all done. Final result of image that has been made amazes me. I like it much. But there is one thing that I never agree that why everything must done on our body as permanently. Is there no other media can be used, in addition to our body ? My ex boy friend has tattoos since his first class on junior high school and when he was in senior high school he can make tattoos too. He had much patients until now with using his special machine. One day, I asked him with a little question, “Why did you do that ? Did you feel pain ?” and I got surprising answer. He said, “The pain is fun. I enjoyed it and I’m getting addicted.” And I can see the result on his body, he has much tattoos on his body, on his white skin body. Talking about tattoo, I remember with one thing. 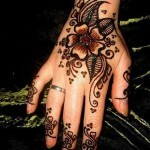 Do you know about Mehndi/ Henna/ Inai ? It’s almost same with tattoo but it’s not permanent, No need to do a tattoo needle. It is an art that has existed since the time of Pharaoh in Egypt and also used by women in India. 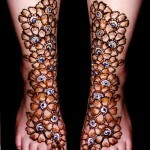 One time, I had a trip to Little India, Singapore, after walked to see the view arround on there, I stopped in a small shop and want to make a Mehndi design on my hands and my feet. But I cancelled it because a friend already gave a call and told me that he want to see me in Orchard. It’s too bad, I can’t make it. About piercings, mmm,, I describe piercings just like a coke for fried chicken. They have a relationship that can not be separated. Both are depicted as a lifestyle and an identity proof. I am not talking about body piercing such as ear piercing for a woman. Again, this is only my opinion. Forgive me if I’ve hurt you by my opinion. It seems I was too conventional. ~ by keishinta on September 2, 2011.